Who doesn't love a unicorn? Spellbinder's Die D-Lites Unicorn Fantasy die is especially D-Lite-ful. This darling Die- D-Lite is part of Spellbinder's new arrivals and is certainly going to add some fun crafty magic to your cards and projects. 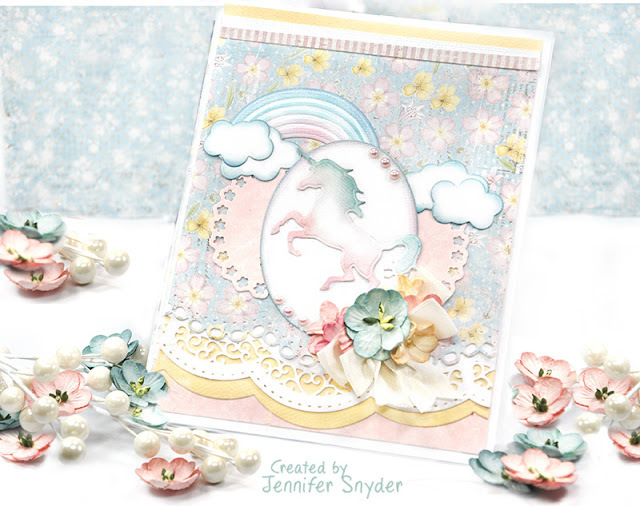 I've certainly been having fun this week with my unicorn set. Spellbinders Die D-Lites collections are perfect for projects like embellishments for planners, journals, scrapbook pages, cards, tags, ATC's and whatever your mind imagines. The unicorn is a wonderful addition to the collection. 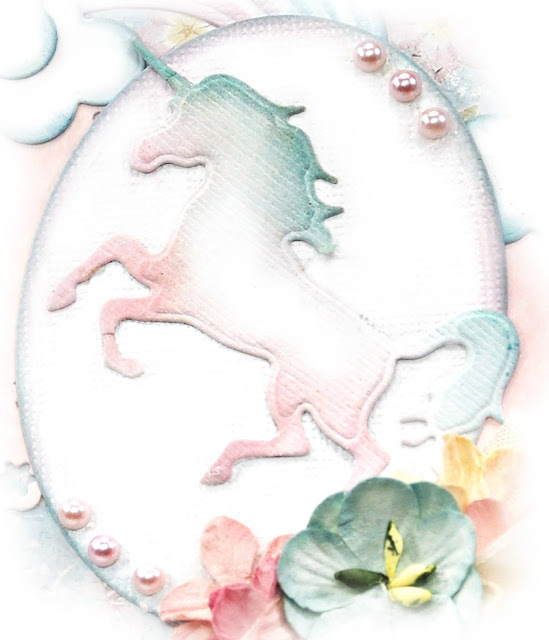 And if you collect unicorns - this is a "must have". Yesterday I posted my first project with the Unicorn Fantasy die . It was a soft pastel application. 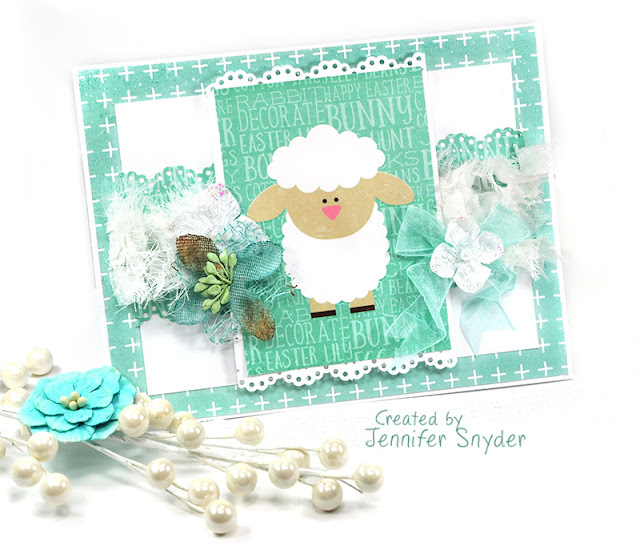 You can see the complete post Part 1 here and the card is pictured below. Today's look is shabby-chic. Your unicorn can be anything you imagine. That's the beauty of the unicorn. 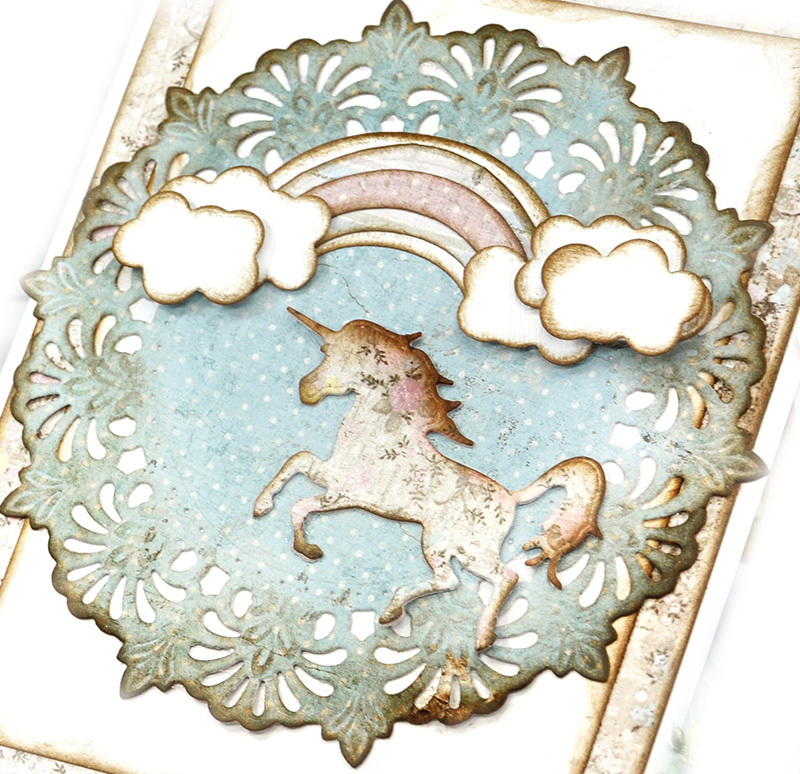 Below is an image of the pieces that come in the Spellbinder's Die D-Lites Unicorn Fantasy die set. 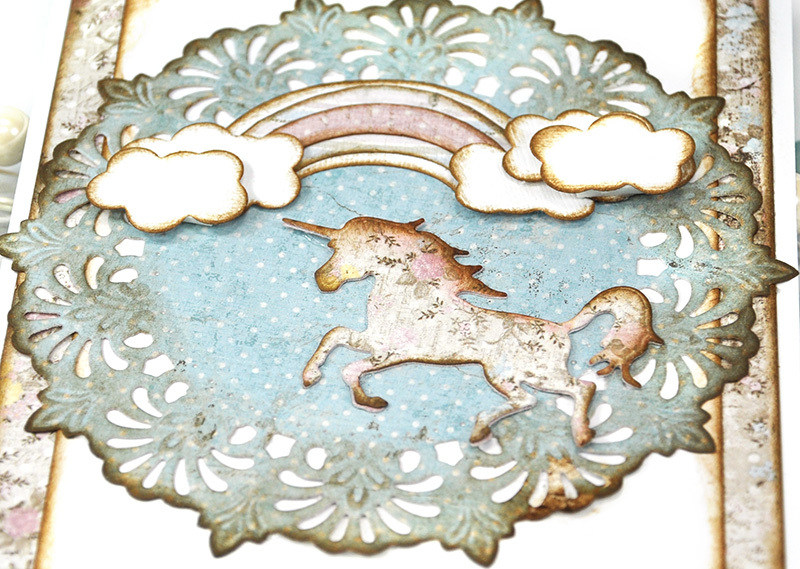 It comes with a sweet unicorn, cloud dies and a rainbow. Spellbinders has another new release that I used on this card as a background doily. It's Nestabilities Ornamental Doily Etched Die . My gorgeous paper is from Maja Design's Vintage Spring Basics Collection. 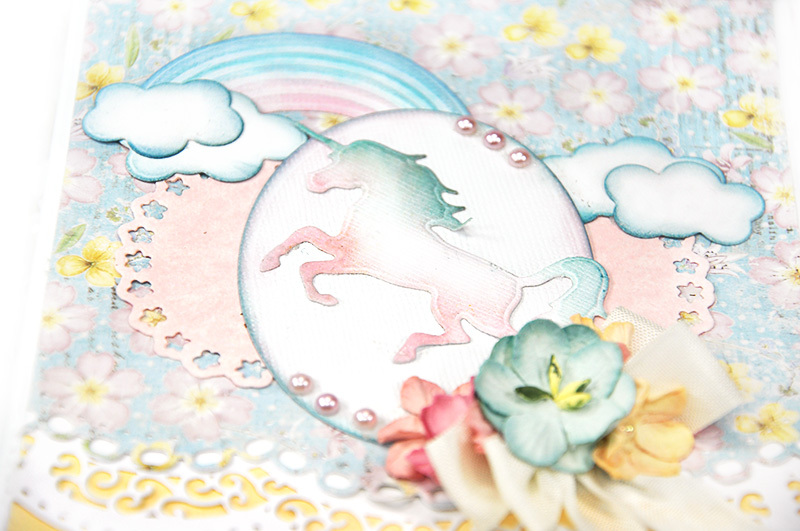 I used the wonderful compact and portable Spellbinders Prizm Die Cutting and Embossing Machine to cut my Unicorn shapes. 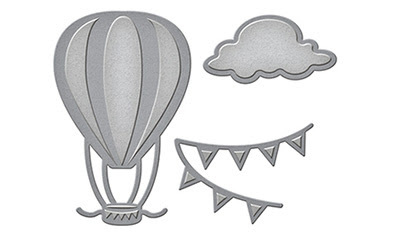 These dies will fit in most die cutting machines, however. 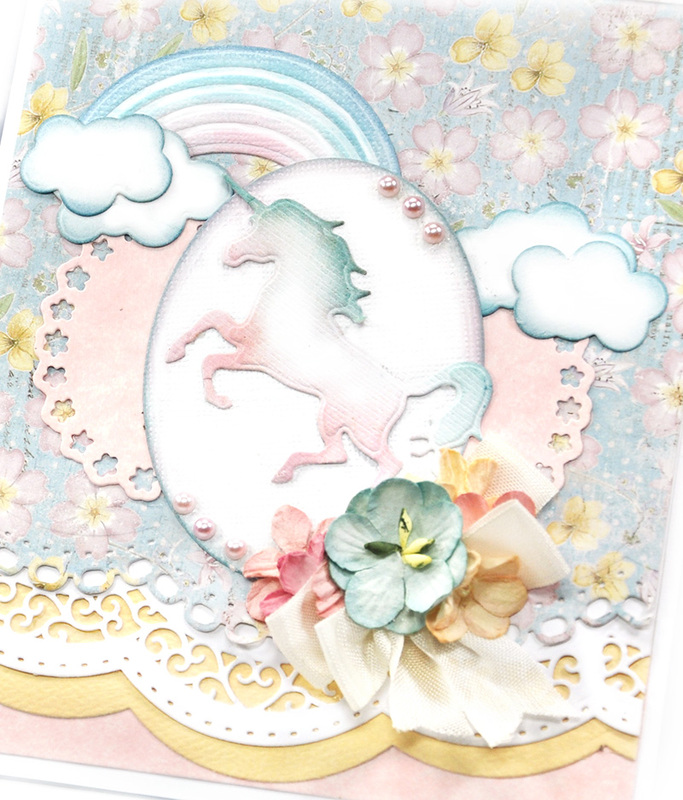 One last closeup of the Spellbinder's Die D-Lites Unicorn Fantasy die. Thanks for stopping here to look. You can see Part 1 of my Unicorns post right here. 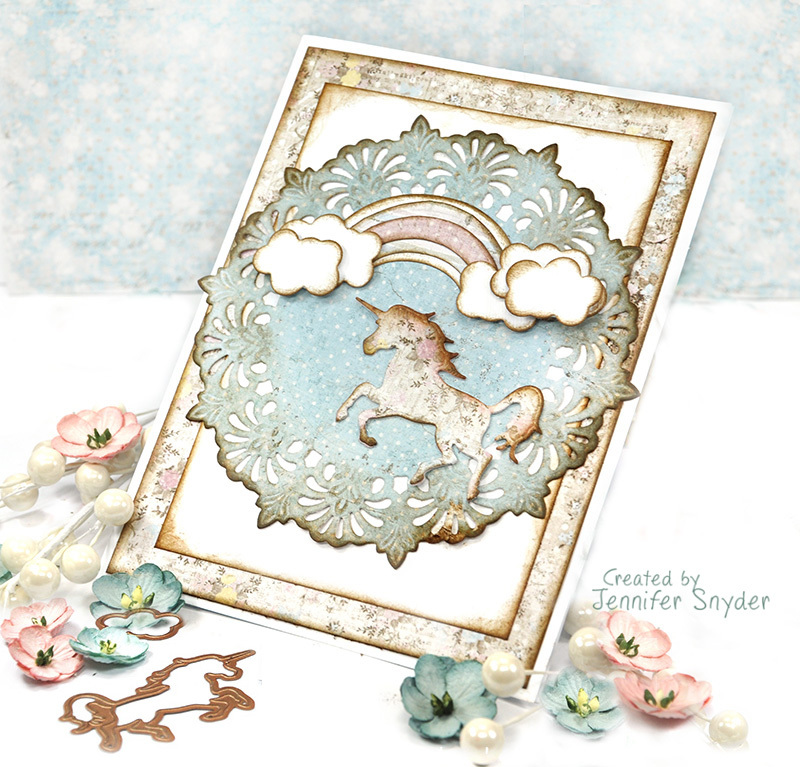 You can find the Spellbinders Die -D-Lites Unicorn Fantasy here. This darling Die- D-Lite is part of Spellbinder's new arrivals and is certainly going to add some fun crafty magic to your cards and projects. 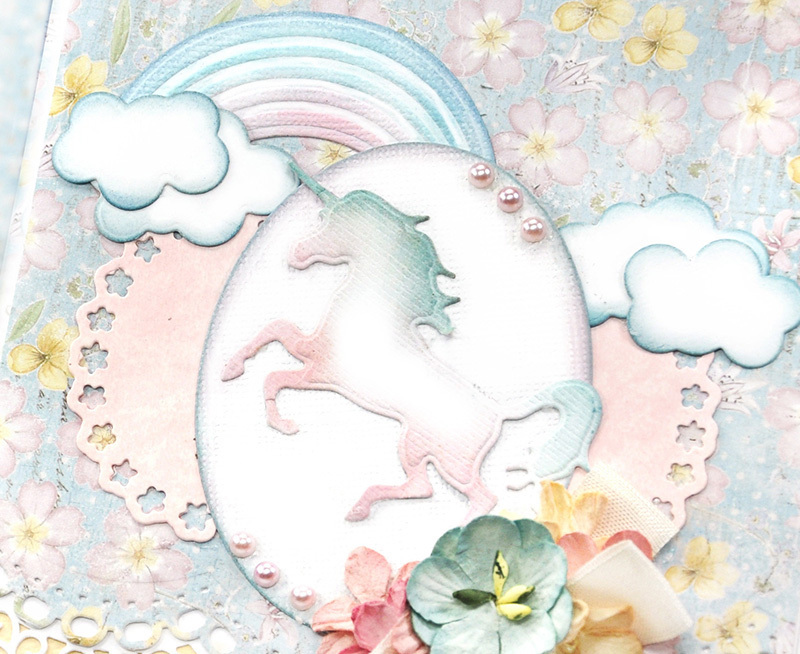 I decided to show a few variations in how I used the unicorn die. I created a soft pastel version - presented today as Part 1 of my post. Part 2 - my shabby chic version can be found here. They can be anything you imagine. That's the beauty of the unicorn. Above is a close up of the darling unicorn shape from Spellbinder's Die D-Lites Unicorn Fantasy die. It's a graceful classic shape. Below is an image of the pieces that come in the die set. 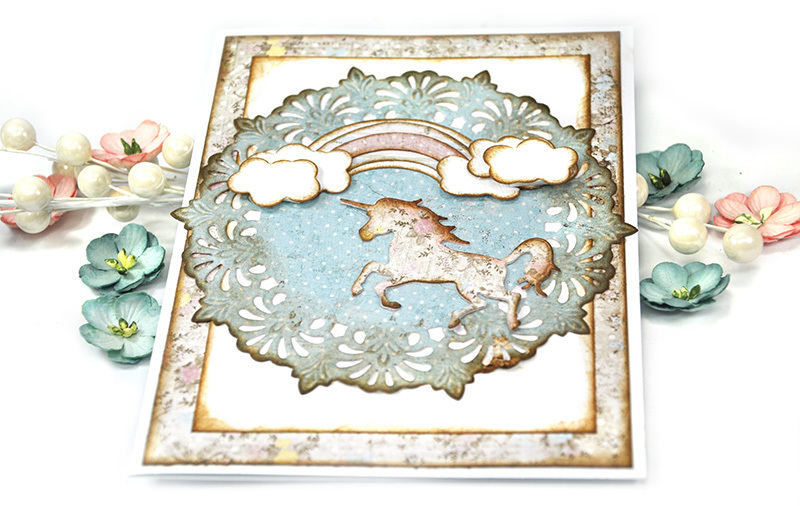 The adorable set comes with a sweet unicorn, cloud dies and a rainbow. 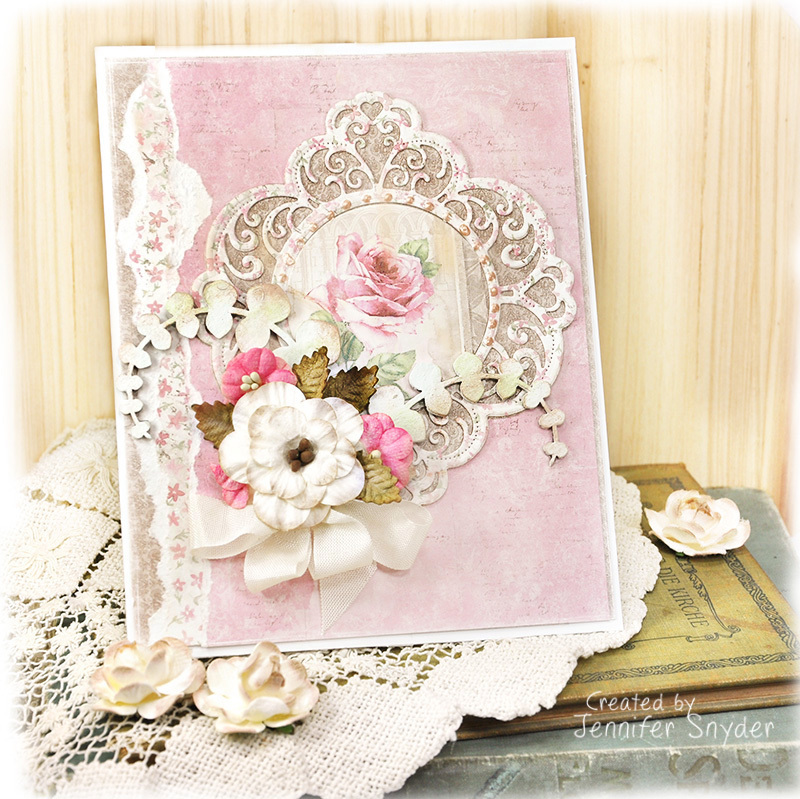 Spellbinders Borderabilities -A2 Borders One Card Creator ( with gorgeous delicate scalloped edges). 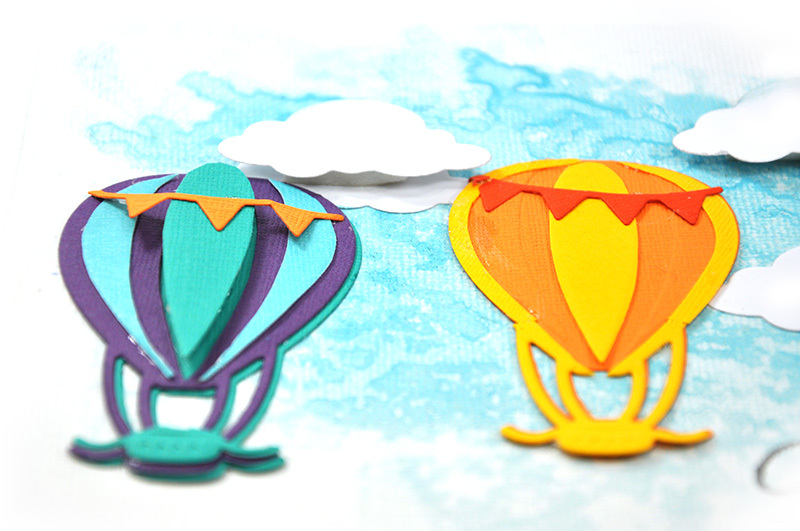 Recently I had the opportunity to create with Maker's Mart Kits by Spellbinders. They sent me the sweet Balloon Banner Kit and asked me to have fun and create. So that's what I did. 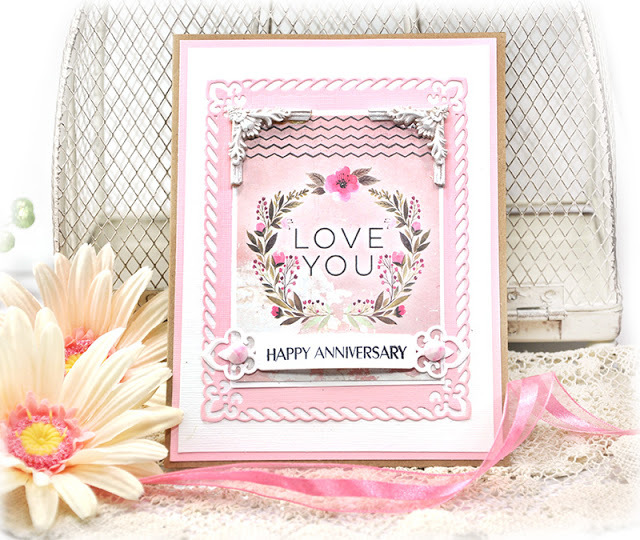 You can see my original post on Spellbinders blog right here. This is the Spellbinders Die D-Lite that came in the kit - Die D-Lites Flight 2. The "Paper Kit" and the "Machine Kits". 1. 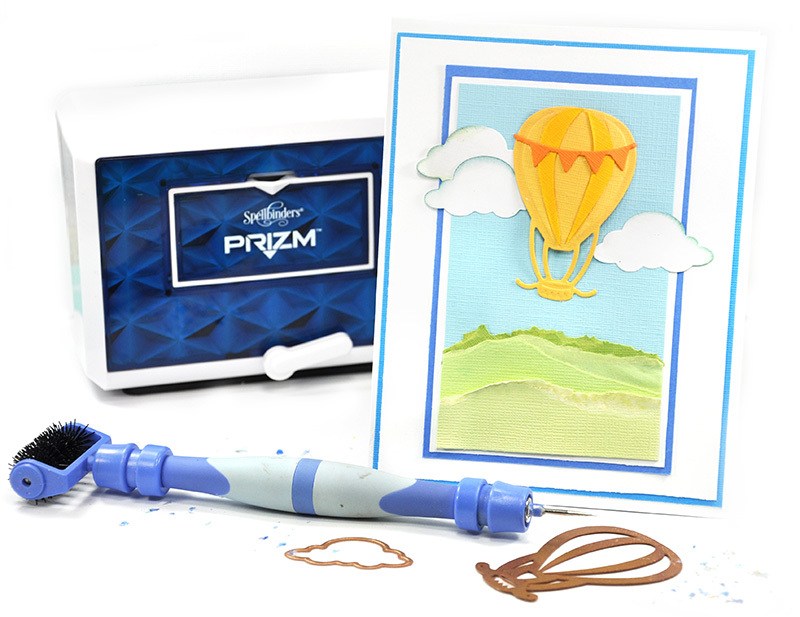 Machine Kit -comes with the Prizm machine , the die, and the Spellbinders Tool 'n One. 2. Paper Kit - comes with papers precut for your convenience. You have all the fun of making the projects even without a machine. 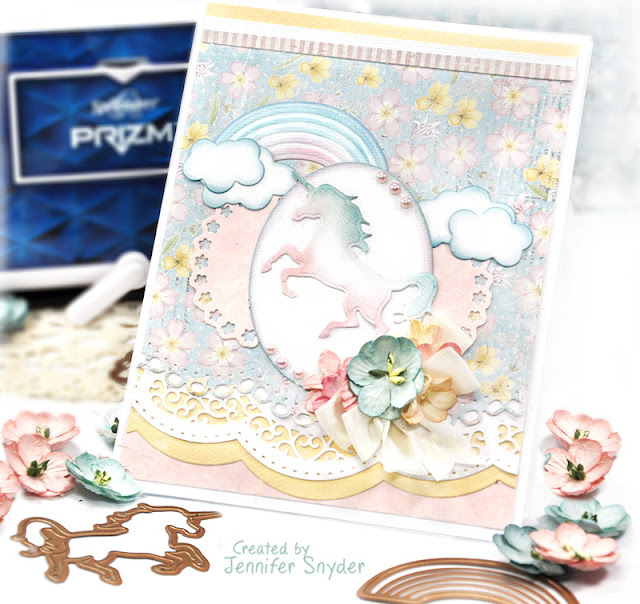 If you do not have a die cutting machine and are interested in a wonderful small compact and portable machine, then the Prizm is a perfect choice. 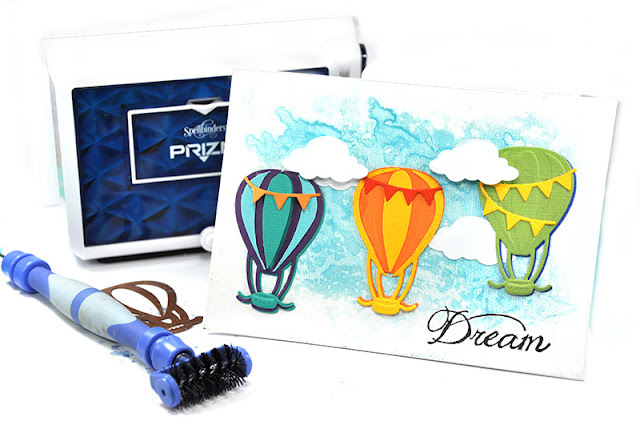 The Spellbinders Prizm Die Cutting and Embossing Machine is lightweight and portable. I decided to show a few different ways to use the die. I have a super short video that shows how I created the following projects. I had a birthday party in mind when I started my projects. 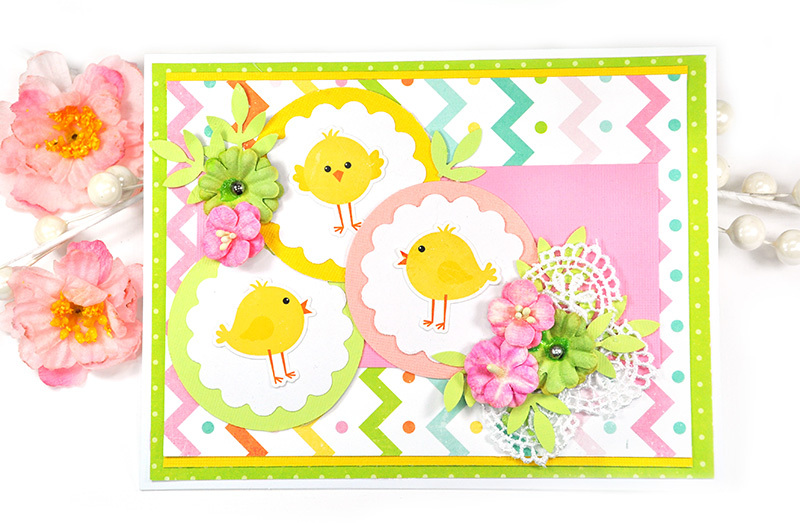 First I made a card with the kit. 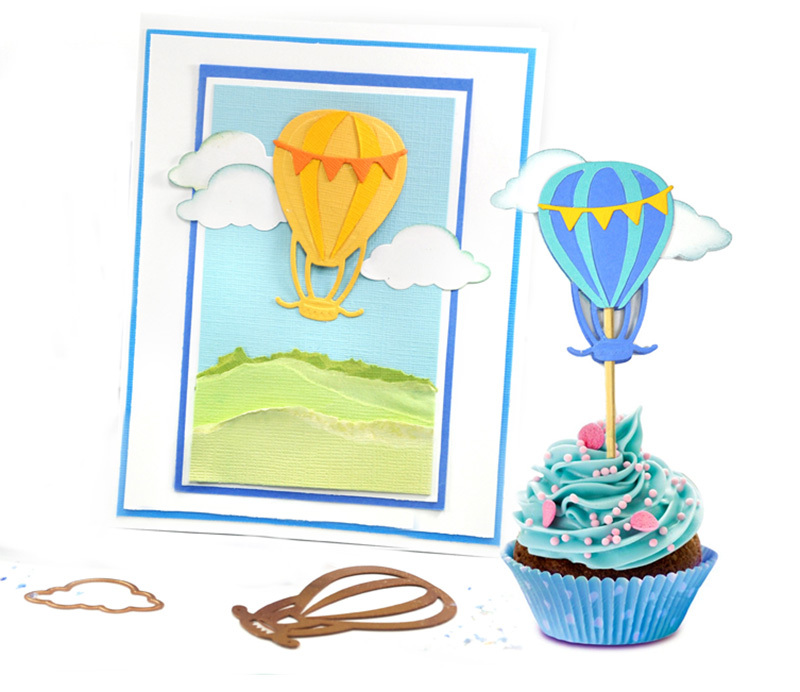 I gave the balloon just a bit of "lift" on the card ( haaaa sorry for the bad pun). It's only a little dimension, and still fits nicely into an envelope but it has a cool effect on the card. The short video shows how I shaped the balloon. 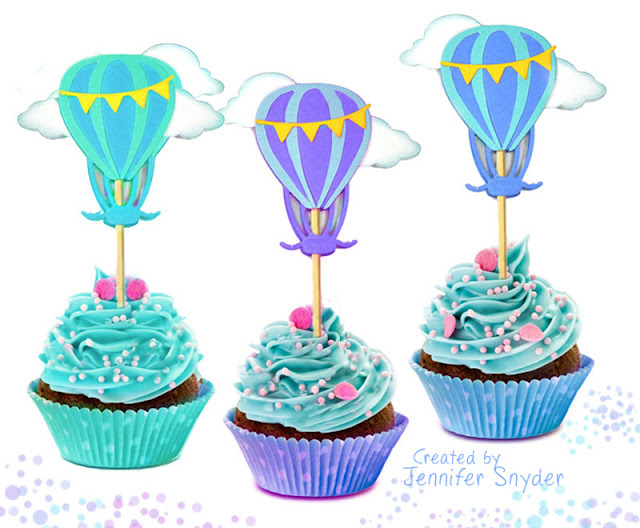 Next I made some cupcake toppers. These are also in the video. Super easy and all the products are included in the kit. Well...almost all the products. You're on your own for the cupcakes. Can't help ya there. Next I decided to create a canvas to go with my card. The canvas is actually pretty dimensional. and you guessed it...the canvas is in the video too. OK - done with the party theme. 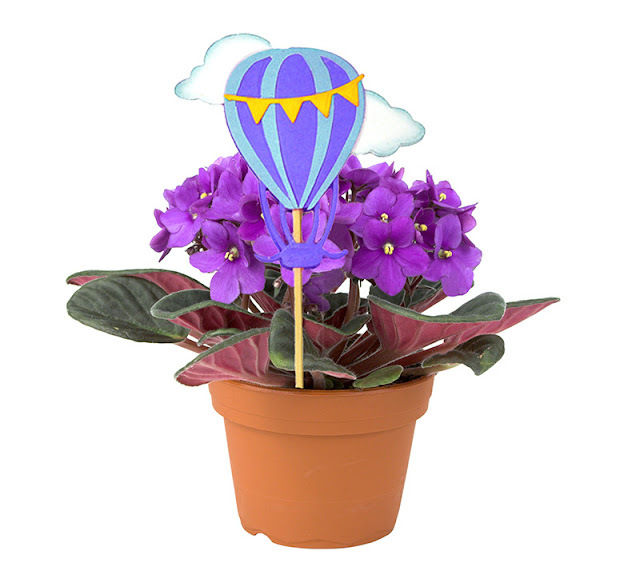 I changed directions a bit and thought I'd "lift" someone's spirits with a flowering plant ( enough with the puns ). I made a balloon pick with my sentiment on the back. Something bright, cheery, and happy. 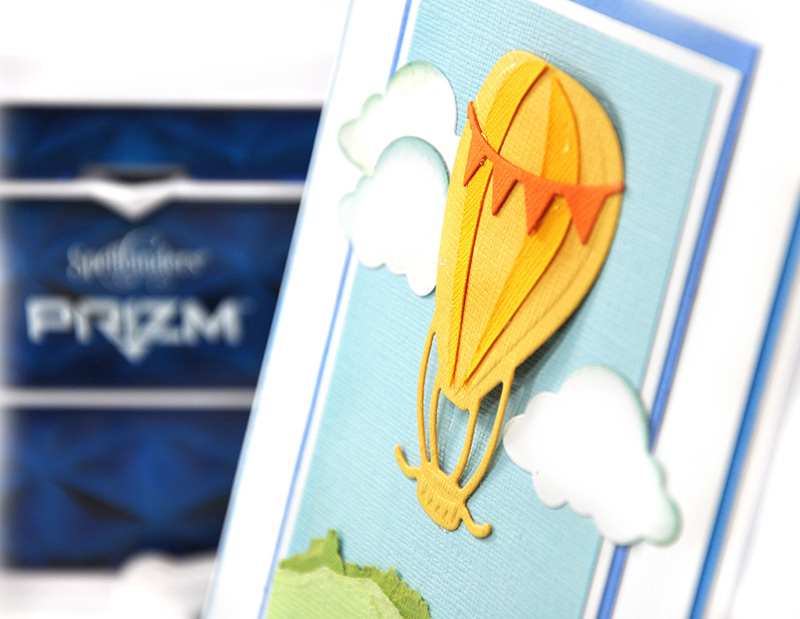 As you can see, there are so many possibilities with the Balloon Banner Prizm Kit. Shop all the Spellbinders right here. On behalf of Petaloo, I'd like to wish everyone a Happy Easter filled with peace, joy, happiness (and possibly some chocolate bunnies or jelly beans too). 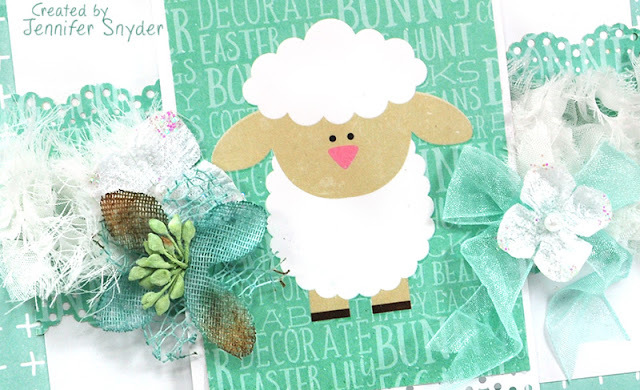 I'd like to share my Easter cards. 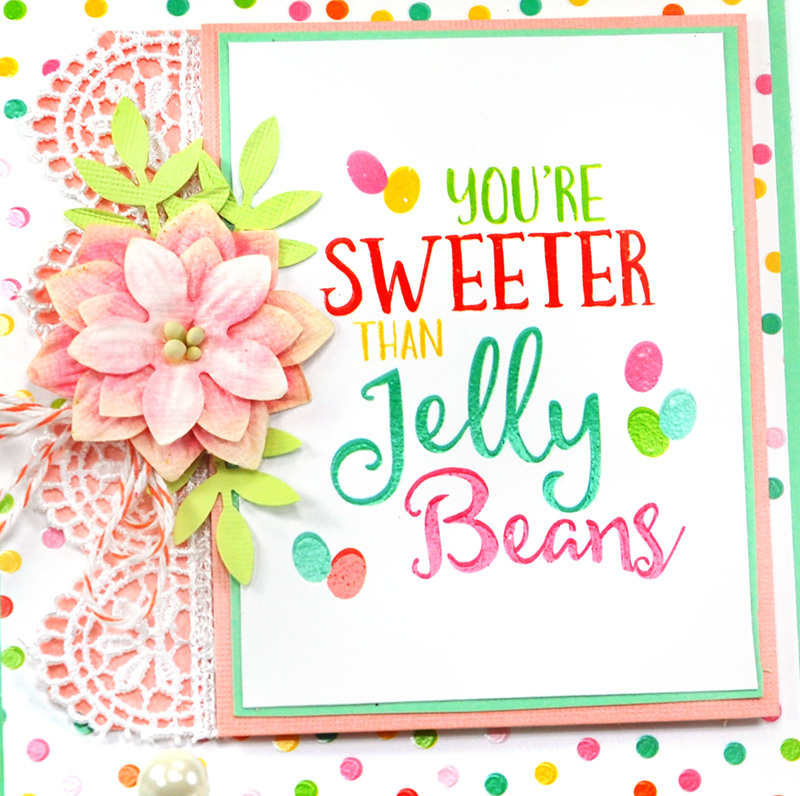 Easter season is a time for bright spring colors - what I call "jelly bean" colors. 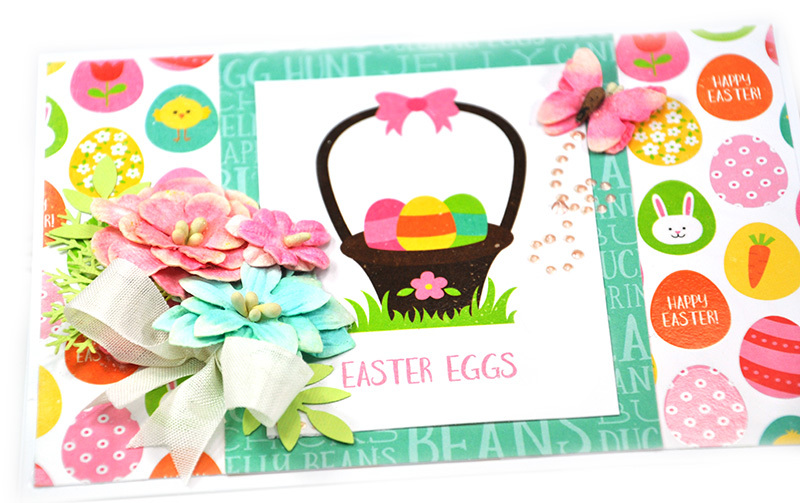 My cards feature these bright colored papers from Echo Park's Celebrate Easter collection - with perfectly coordinated Petaloo flowers. This is my first card. 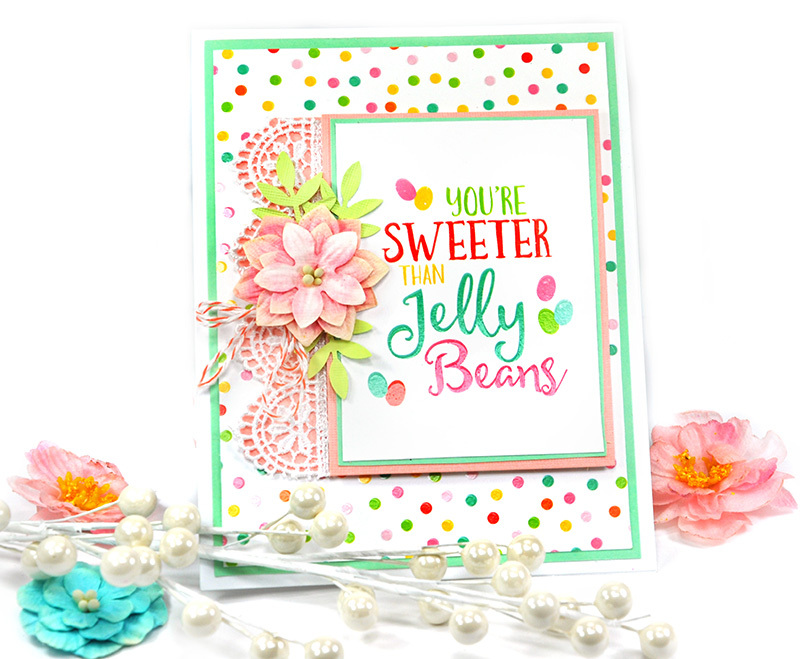 It's soft and sweet and adorned with gorgeous Petaloo. I have a combination of Petaloo's popular Mixed Textured Blossoms in Teal and some new blooms from the Spring collection: Petaloo's Botanica Collection - Hydrangeas in White (shipping soon) . This next card is absolutely "jelly bean " colored. Just take a look at the close up below. It makes my mouth water for those fruity green and orange jelly beans...most certainly NOT the black licorice ones. The soft beautiful flower on this card is Petaloo Darjeeling's Teastained Dahlias in Pink. I simply added some light green punched fronds for filler. 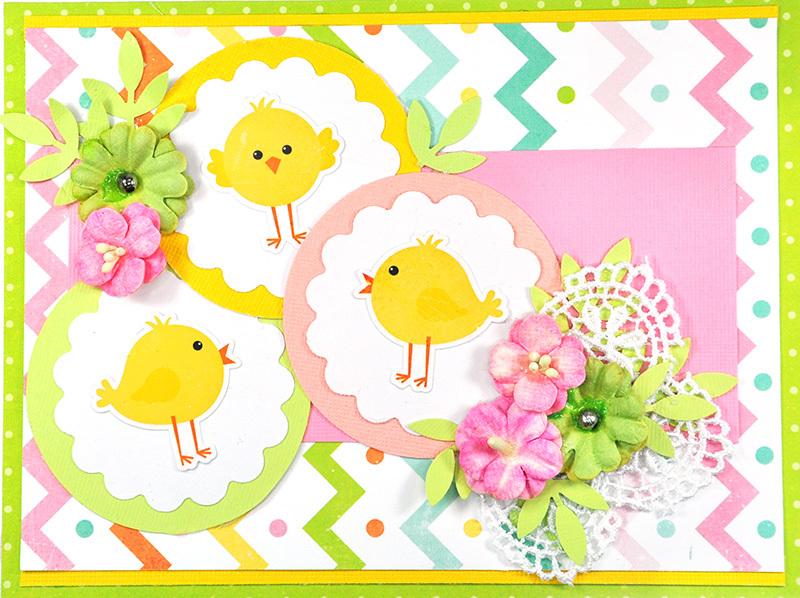 This is my last card made with Echo Park's joyful paper collection, "Celebrate Easter". 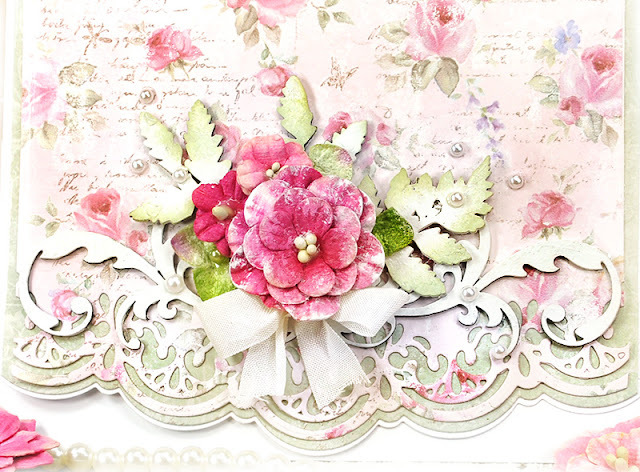 This card uses the Darjeeling Teastained Petites flowers in Green and Pink. Keep watching for the new releases. Rumor has it they are out soon. I'm A SpellBlogger for Spellbinders. Yep that's true. I'm as excited as can be. 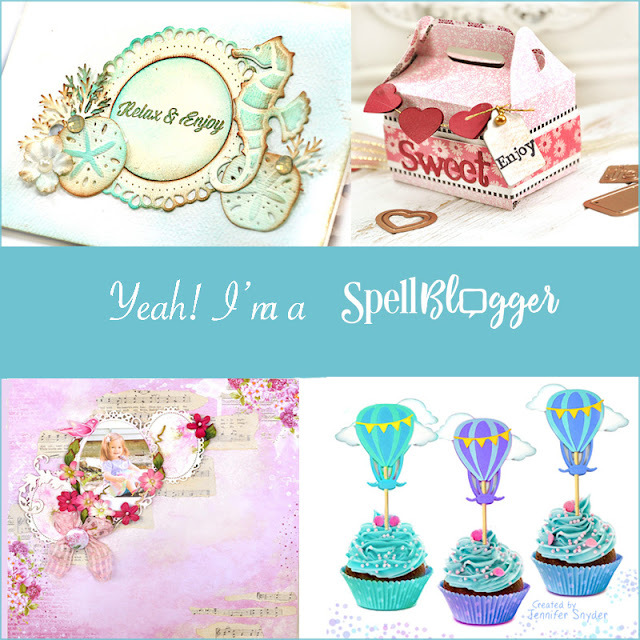 I was invited to transition from Spellbinders's Star Shopper to SpellBlogger, where I'll be being featured monthly on the Spellbinder's blog. 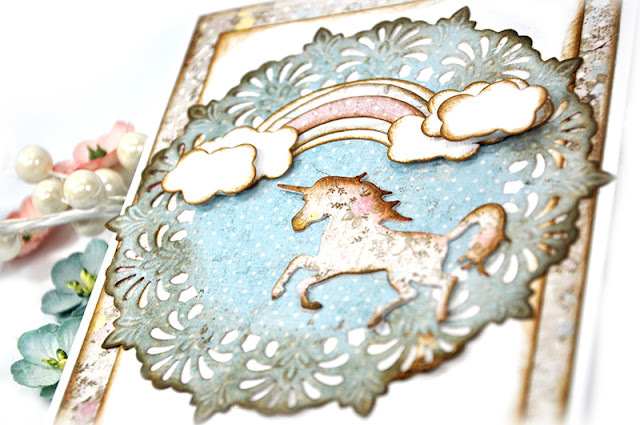 As part of the Spellbinder's Star Shopping Team, I would periodically receive product from Spellbinders to review, create videos and promote new product as well as the Maker's Mart Kits by Spellbinders. I'd like to share a few of the super short videos and projects I have created for Spellbinders and Maker's Mart. This is a sweet little treat box I made using the Maker's Mart Die of the Month featuring the Tote Shaped Treat Box. I several different treat boxes to show how versatile this is for so many occasions. 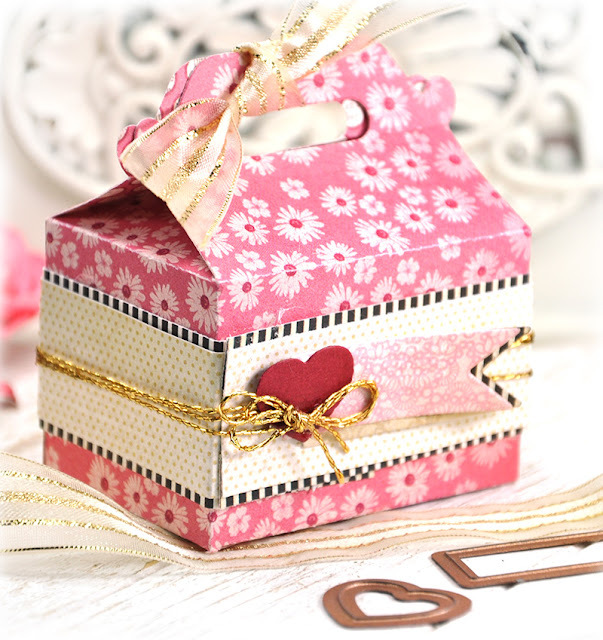 My blog post with the whole ensemble of treat boxes is here. In fact you can still grab this wonderful Die Kit -here. Here is a 3 min video I created showing how to assemble the treat box. I also provided several inspirational options using the die set. Here is another card and video created using the Maker' Mart Die of the Month Kit. 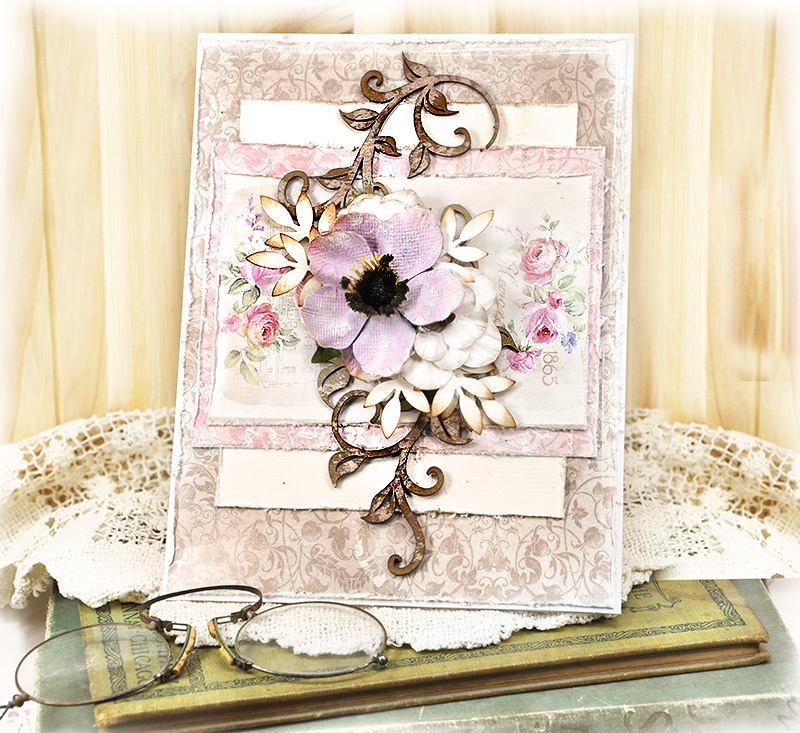 I had a lot of fun with this floral die and had to pull myself away from making cards with handmade flowers in order to get the video finished. You can see all the card samples here on my blog. You can still grab this Die Kit from Maker's Mart as well, right here. This was the Poppy Die Set. 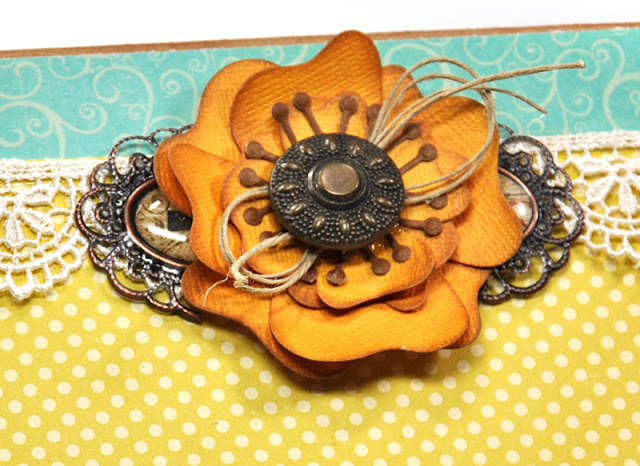 Here is the super short video showing a variety of ways to use the flower die. 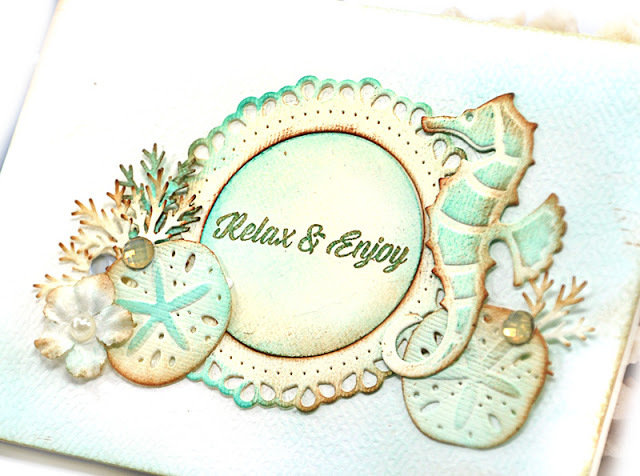 Here is another fun card I made using Spellbinders Die D-lites and the amazing portable Prizm Die Cutting and Embossing Machine. You can see my original post here with a variety of Die D-Lite samples being used. 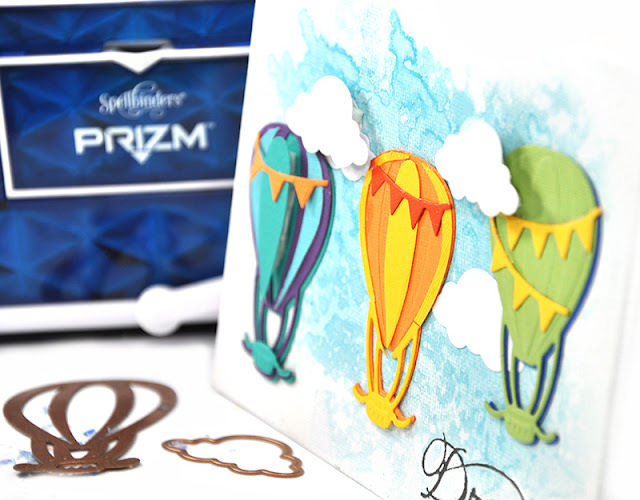 This is the short video I created to show how easy and portable the Spellbinders Prizm machine is. 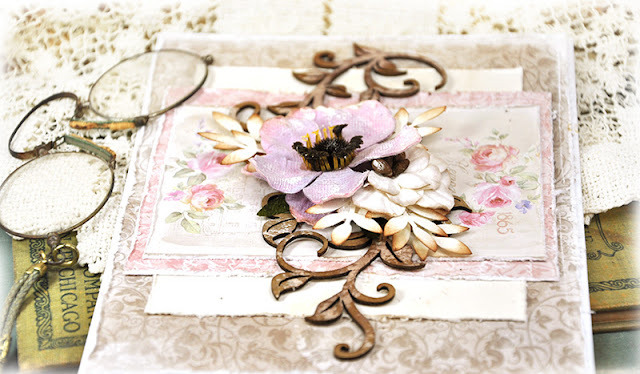 You can follow Spellbinders on Pinterest right here. And dare I say PRIZES????? OK I said it. 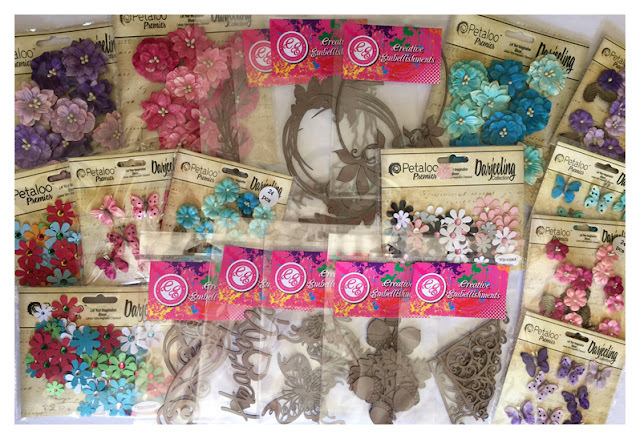 yes there will be prizes offered at the Petaloo and Creative Embellishments blog. You can find the prize at the bottom of this post so scroll on down. This means I had the opportunity to add Creative Embellishments chipboard to my cards. That brings a giant smile to my face. You can see the creative projects from both teams and join the hop at Petaloo's blog here and Creative Embellishments right here. 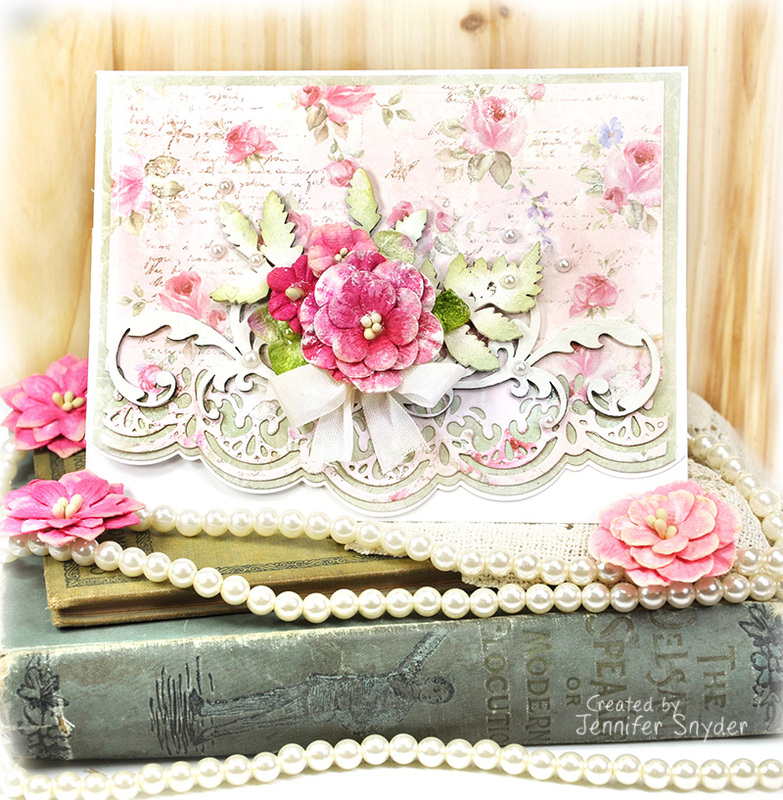 Mother's Day is fast approaching so I created 3 cards with a feminine touch just for the occasion. It'll be here in a blink and I'll be prepared. This is my first card. I used Maja Design's newly re-released Sofiero collection for each of my cards. 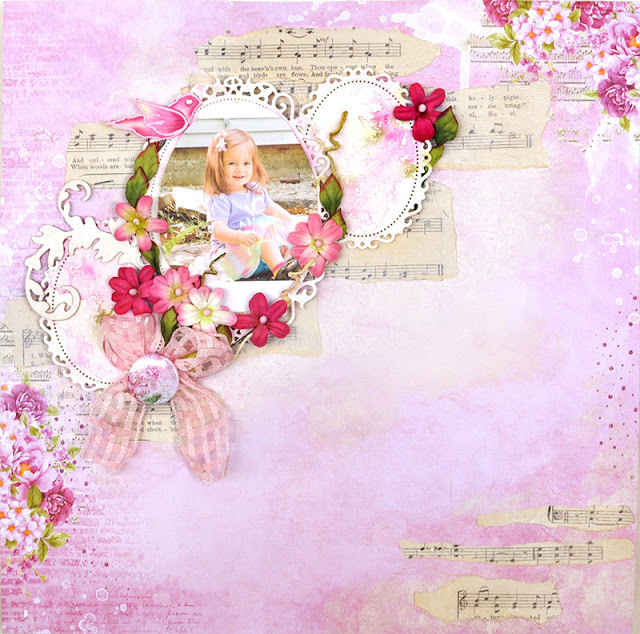 I also created a card that played along with the mood board for Maja Design. 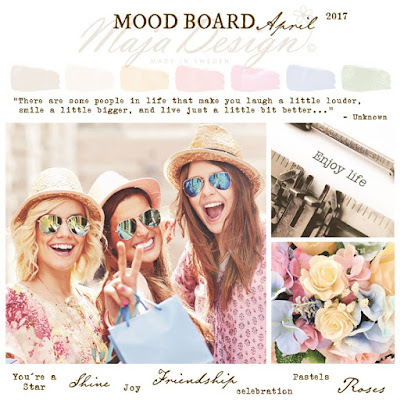 Won't you please consider trying your hand at the mood board? YOu can find all the rules right here. Here is a close up of the embellishments on this card. 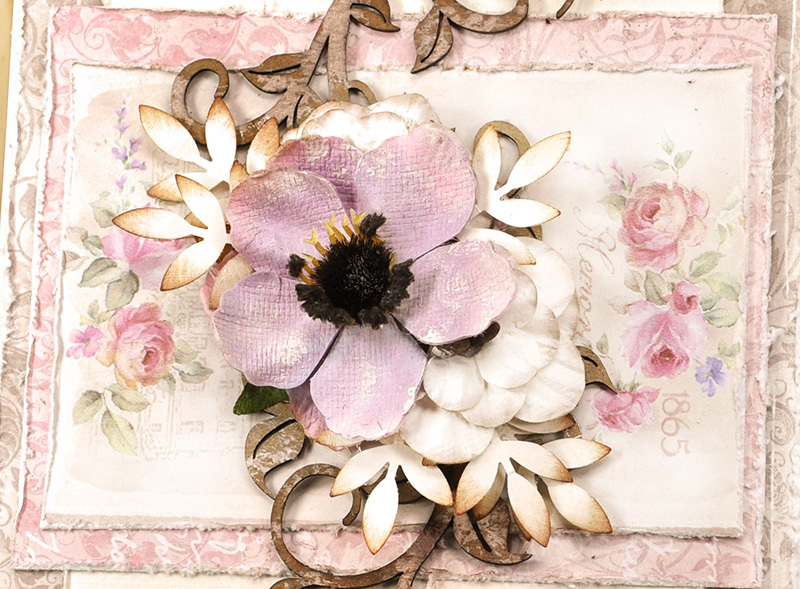 The gorgeous lavender flower is Petaloo's Darjeeling Anemone in Purple . The accenting cream flowers are Petaloo's Darjeeling Teastained Cream Dahlias . 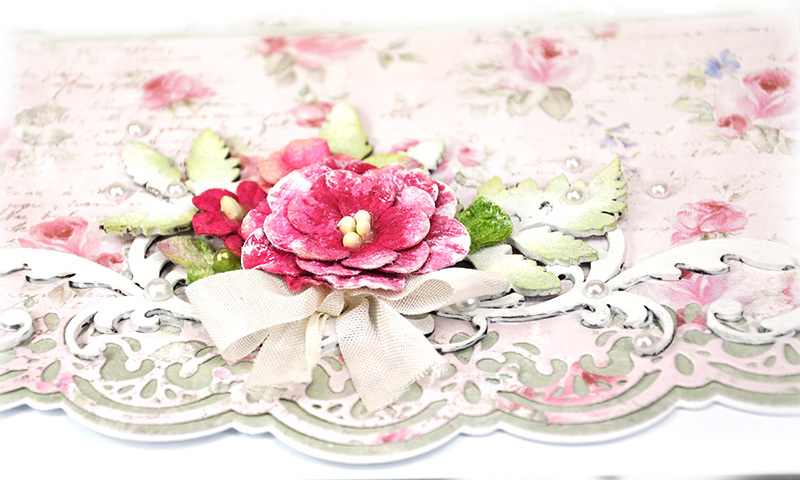 The floral cluster rests atop a sweet chipboard piece, Creative Embellishments Chipboard - Flourish Set 2, I kept the chipboard the natural color and dabbed some whitewash over the chipboard. 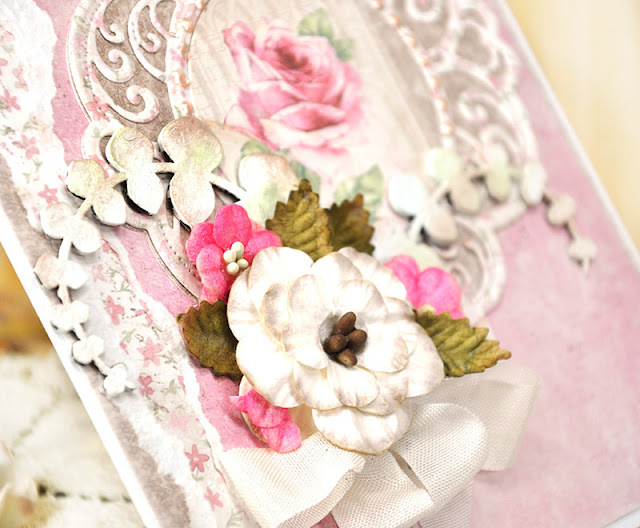 Here's a close up of the beautiful embellishments. The chipboard treatments were kept quite simple with just white acrylic paint and a touch of brown edge inking. 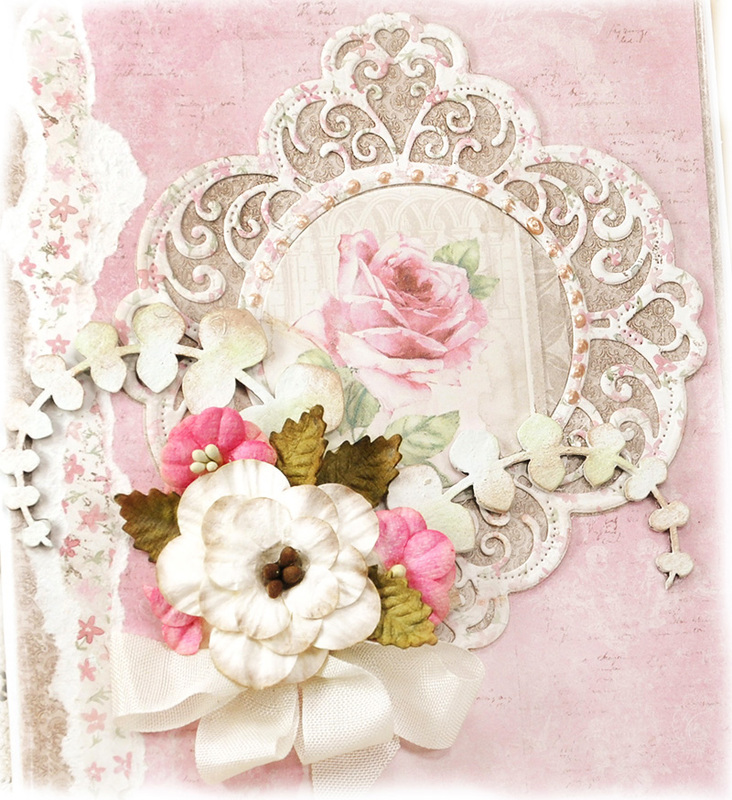 My last card is also rather delicate thanks to Petaloo and Creative Embellishments. 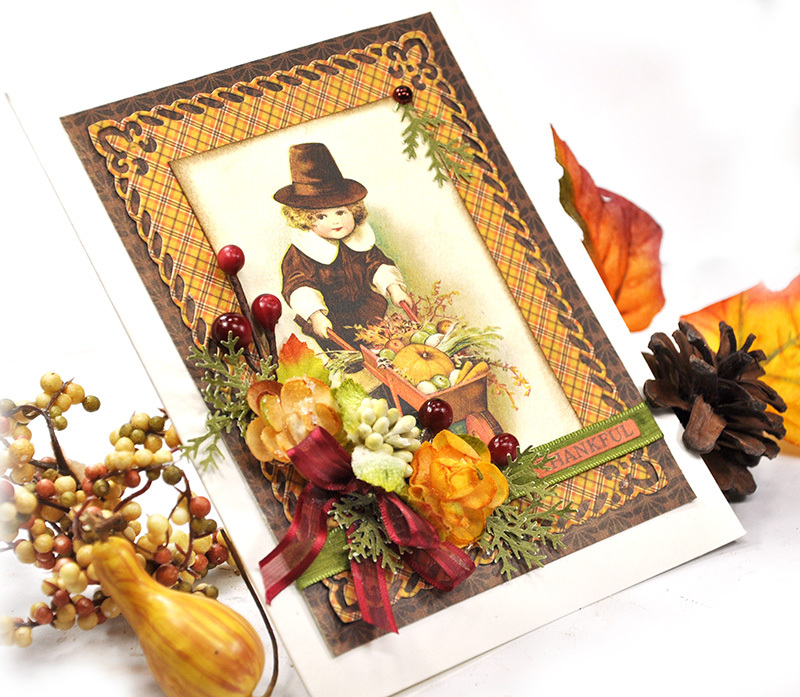 Now you may say to yourself -"hmmmm crazy Jennifer says she used Petaloo's Maroon Hydrangeas on this card. And yet I see no maroon." Well let me tell you how cool one packet of Petaloo Velvet - Hydrangeas in Maroon can be. The packet of hydrangeas has so many variations of color. I took a flower that had a little less maroon and more green and cream. I cut it to add as the greens in the cluster. I did not want to use the leaves from the package because they just were too big for my floral cluster. 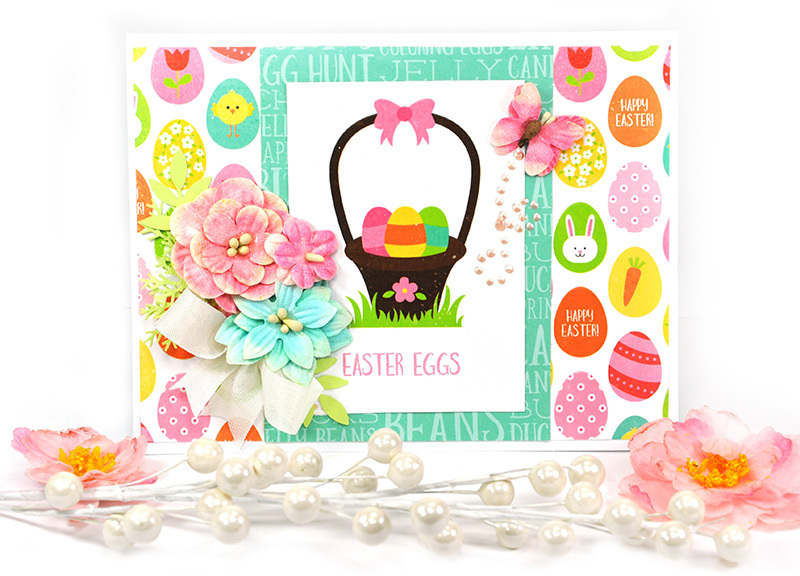 Don't forget to hop on over to the Creative Embellishments Blog found here for more gorgeous inspiration and a chance to win some prizes. You can continue the blog hop and shop for Creative Embellishments chipboard right here. Oh - one last item. Let's talk a bit more about the Blog Hop prizes....take a look. Lots of flowers and chippies for your hearts delight. There are 5 ways to win. You'll find the rules posted at the end of each post on the Petaloo Blog. DON'T MISS OUT.